A few weeks ago, I was browsing around mpix.com while ordered a print there. I noticed another product they sell is puzzles. I considered ordering one there, but the biggest size they have is 12×18, 300 pieces, and if I was buying one, I’d want something bigger than that. It got started looking around the web at puzzle options. I eventually settled on VenusPuzzle.com, and ordered their Puzzle 1000 from this picture: http://flickr.com/photos/penner42/2448579860/. It wasn’t cheap, at $73 shipped for an 18×28, 1000 piece puzzle, but it also wasn’t the most expensive option I looked at either. One place was twice as expensive. One of the main reasons I went with VenusPuzzle.com is that it was the only place that clearly stated aspect ratio for each size puzzle, and had the right ratio (1:1.5) for the size puzzle I wanted. It was also the only place I saw with good reviews at Reseller Ratings, though there were only four of them. I placed my order on Thursday, 10/16, with their expedited shipping option. They’re in Slovakia, so it was already Friday morning for them. It shipped Monday, 10/20, and I had it Tuesday 10/28. I would have had it on Monday if I was home to sign for it, but instead I had to go pick it up at the post office. It wasn’t shipping a box like I was expecting, just a white bubble-wrap envelope, and with some extra cardboard around the puzzle box. I guess they know what they’re doing, because it arrived with no damage to the box. The box itself was very nice, and also one of the reasons I ordered from there. Some of the other places also had similar boxes, but some did not. The only minor issue is the image for the puzzle is vertical, and printed horizontal on the side of the box. It’s really not a big deal, and if you use a horizontal image it’s no problem at all. The puzzle pieces come in a resealable plastic bag inside the box. 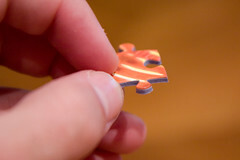 The puzzle pieces look and feel just like pieces from any other puzzle you could go out and buy. They feel solid and well made, and the cuts are smooth. They fit together exactly as you’d expect from a puzzle. The colors are bright, and the photo is a high quality print. Putting the whole thing together was a lot of fun. It took me somewhere around 20 hours to complete, and only a few times did I put pieces in the wrong place. Mostly it was in the solid blue area in the top right, and once the last few pieces didn’t fit, finding the ones that were in wrong didn’t take very long. VenusPuzzle.com is highly recommended, and I would order from them again. In fact, I’m already thinking about which picture to get if I order another puzzle. If I do, I’ll likely get one that’ll be harder to complete, and possibly take a lot longer than 20 hours: http://flickr.com/photos/penner42/2435040936/. 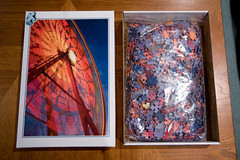 There are a few pictures of the puzzle in progress in the Flickr set. is the site trustworthy in terms of credit card usage? I had no problems with them, and have since ordered from them again. 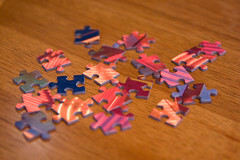 Alan, would you like to post the high-res pictures of your complete puzzle(s) on our Facebook Timeline? (www.facebook.com/VenusPuzzle)? Your post helped my decide to give Venus Puzzle a try. I ordered the 2,000 pc puzzle. Every time we contacted them they replied promptly. A small mistake was made with our order and they dealt with it rapidly and did far more than just amend the problem. Also, I still cannot understand how they got the puzzle to us so quickly, but I’m not complaining! Overall, excellent customer service. The price was a great deal. 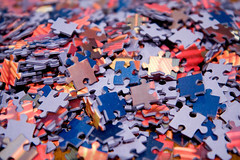 Some of the puzzle pieces on a large puzzle like ours were almost identical. But with the good picture quality, it was easy to not put it in the wrong place. The trick with the larger puzzles is to submit a high quality file that does not have large areas of a solid color (unless you take your sanity lightly), not just one ordinary picture you took with your joe camera. For us, we put together a collage of almost 200 pictures and submitted that file and it turned out amazing. There were a few lines in the puzzle where the ink was off by a hair but you really really had to look close to notice. Not a big deal at all. You can pay tons extra to get “fancier” pieces and a higher probability of an absolutely perfect print job, but I would say Venus Puzzle is the best bang or your buck, hands down. I’m just curious if you know whether or not Venus has the ability to produce collage puzzles? I’m hoping to create one as a gift—an 80th birthday celebration memory—and I can’t seem to upload more than one photo. I’ve also contacted them but wondered if you knew…or if you could recommend another company that can do this?